O​dds are good you have never heard the name "StarText" and have no idea what it is, or was. In the days before the Web, there were thousands of Bulletin Board Services and a handful of major online networks, like CompuServe and The Source, rushing to connect people around the world. But I would like to submit for your consideration: StarText stood apart. It was in many ways -- different. In a word ... special. 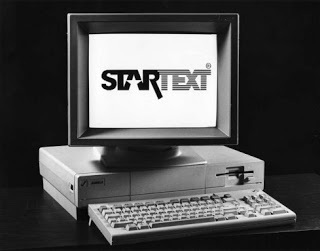 In the many years that have passed since StarText made its debut -- May 3, 1982 -- technology has moved on and so have the people who conceived, built and used StarText. But as one of those pioneers who opted to "go West" when the Internet wasn't even a twinkle in the eye of a modem, it's that "specialness" that deserves to be told. That's part of the story as well. And another facet to be explored. This effort is lovingly dedicated to the workers, subscribers and followers of StarText, all the special people who made it special. And on a personal note, to my wonderful soulmate and wife, Pam, who endured more than I'll ever know while her husband followed his dream. This is for her, and all of you. StarText and Tandy part ways. Subscribers top 1,000; new software launches. HomeBanking, online encycloedia and more. We can't wait for 1990 ... 2010 ... and 2020! StarText joins the industry conference circuit.